The Cadet Patrol Boot is a leather and Nylon boot with a padded that gives exceedingly good comfort. This is a budget value for money boot and good for cadets or anyone not needing a heavy duty boot. The are brown and suitable in colour for the new mod uniforms that the Cadets are now issued with. It has a thinsulate lining and insole ( this can be changed when worn out and easily replaced) which will keep your toes warm.This Patrol Boot comes with a good grips sole unite for slippery surfaces giving you more confidence to get on with the job in hand. 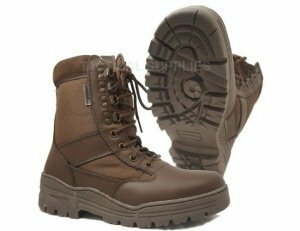 It is a comfortable boot with good all round support especially at the ankles where is it most needed. This boot has been a good seller. It is a lightweight boot for light duties. it is a unisex boot and comes in size from 3 to 13. It is important to look after you boots by keeping them clean and well polished.If they get wet then they will need to be aired but not in front of a heat such as a fire or radiator. Warranty will not be honored if boots are not cleaned and polished regularly.